Archive, save, and backup Outlook e-mail messages. Easily save email messages outside of Outlook. Use MessageSave for email archiving, backup, document management, sharing, legal compliance, and much more. Backup, save and archive Outlook e-mail messages on hard disk, network drive, CD-R, etc. 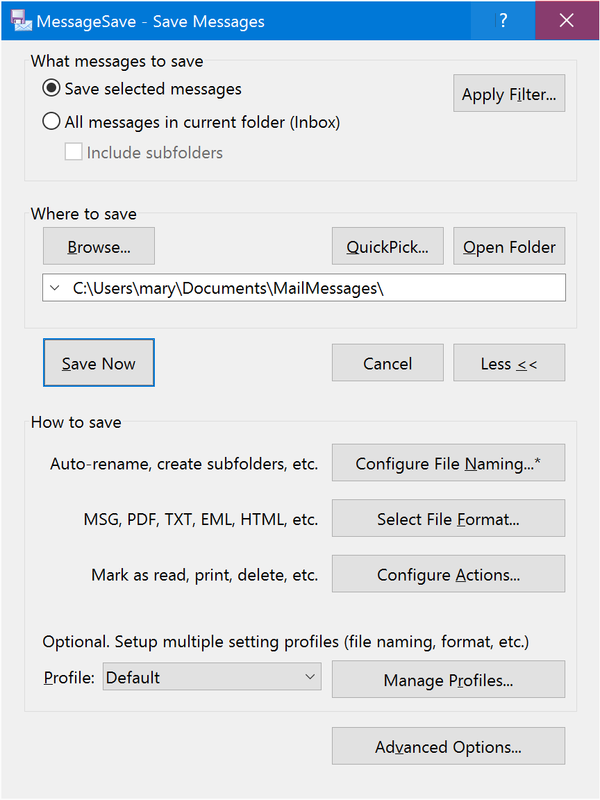 Save Outlook email messages, including attachments, as individual files. Organize messages in file system folders for easy access, sharing and filing. Institute consistent email archiving policy in your organization. Keep email message along with other related documents. Store messages for legal compliance. Keep audit trail of email messages. Standardize your organization's email storage policy. Reduce mailbox/PST size. Offload Exchange storage. 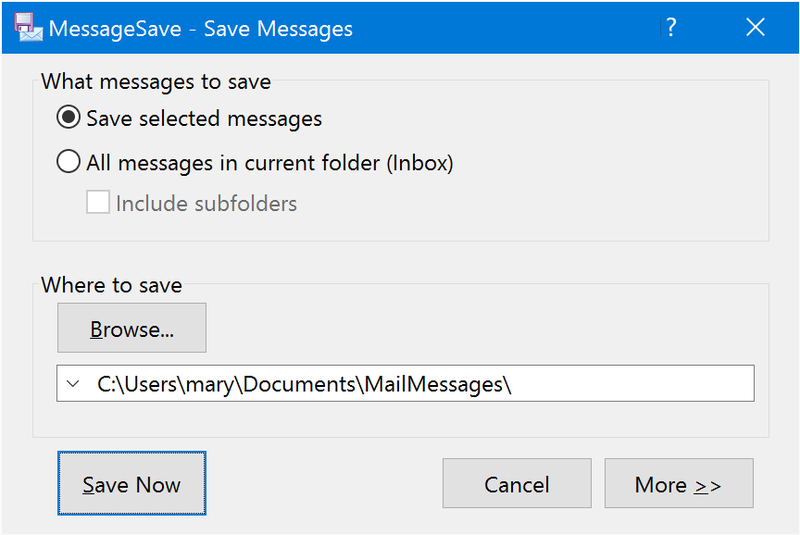 Automatically save messages with Outlook rules. Process Outlook messages with custom scripts. Easily save one, multiple or all messages with one mouse click. Flexible and customizable file and subfolder naming. Save messages in .msg, .txt, .eml, mbox* , vCard (.vcf) and iCalendar (.ics) formats. Works on sent and received messages. Preserves email timestamps on saved files. Saved .msg files include the entire message content, including attachments. Compatible with Windows Desktop Search for easy searching and retrieval of saved messages. Works on Tasks and Contacts. Extensible with custom scripts. API reference. 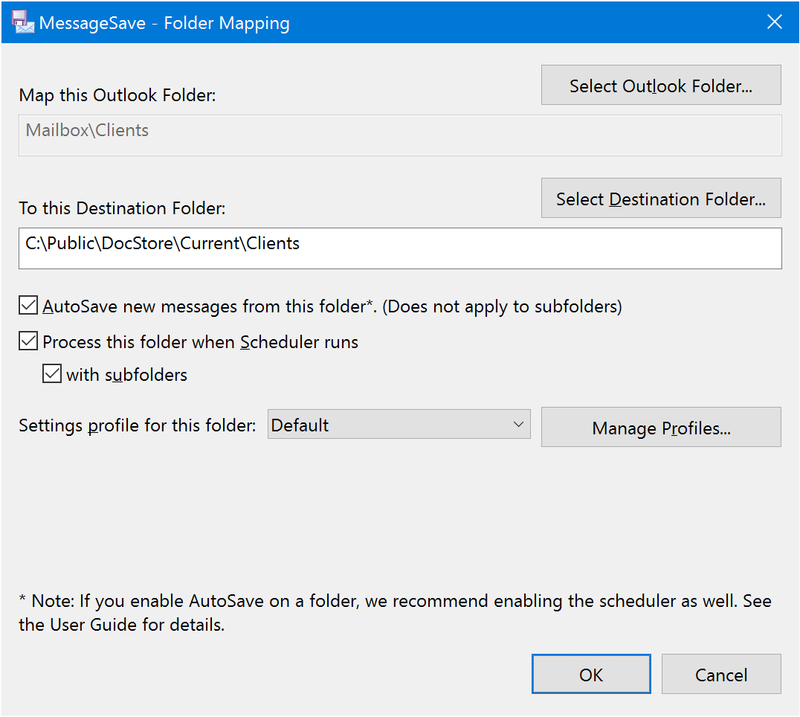 Automatically save messages with Outlook rules (custom rule action) or using a scheduler. Export Outlook folders as RSS 2.0 files. Read messages in plain text without annoying images and popups. Easily view/save full Internet (RFC 822) message headers. Highly optimized for speed and size (download is only 420KB). Compatible with 2003, 2007 and 2010. Supports large-scale deployment and administration. An ability to centrally control settings by system administrators. Export email messages, Contacts and Calendar in format compatible with Mac Apple Mail and Entourage. Outlook 2007, 2010, 2013, 2016 (64 and 32 bit) with the latest Service Pack. All MessageSave for Microsoft Outlook reviews, submitted ratings and written comments become the sole property of Windows 7 download. You acknowledge that you, not windows7download, are responsible for the contents of your submission. However, windows7download reserves the right to remove or refuse to post any submission for any reason. Windows 7 Download periodically updates pricing and software information of MessageSave for Microsoft Outlook full version from the publisher, but some information may be out-of-date. You should confirm all information. Using warez version, crack, warez passwords, patches, serial numbers, registration codes, key generator, pirate key, keymaker or keygen for MessageSave for Microsoft Outlook license key is illegal and prevent future development of MessageSave for Microsoft Outlook. Download links are directly from our mirrors or publisher's website, MessageSave for Microsoft Outlook torrent or shared files from free file sharing and free upload services, including Rapidshare, MegaUpload, YouSendIt, SendSpace, DepositFiles, DivShare, HellShare, HotFile, FileServe or MediaFire, are not used.